Microdyn-Nadir and Huber have been cooperating successfully since 2003. 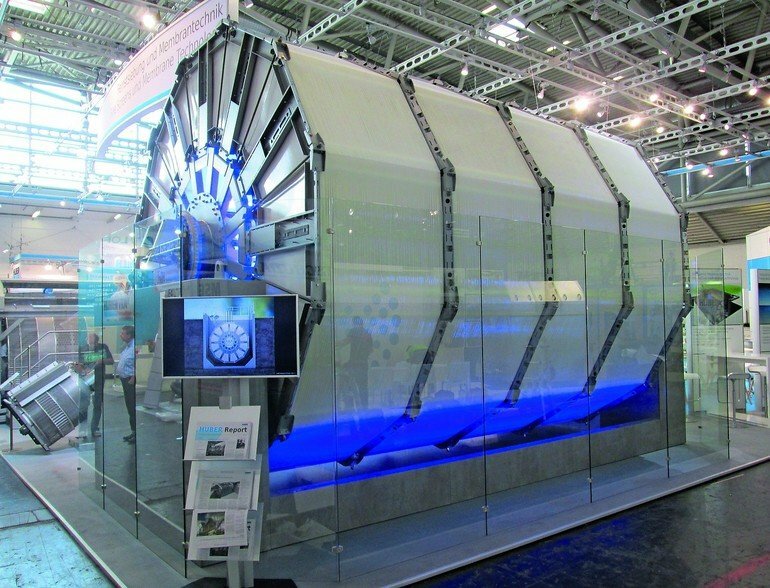 Recently, at Ifat 2016 in Munich, the two companies presented a milestone in MBR technology: a submerged, rotating membrane filter module which is equipped with membrane laminate. 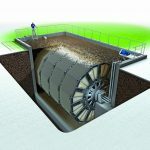 In practice, this combination results in reduced operating and investments costs and, at the same time, also increases operating reliability and packing density. The Microdyn-Nadir membrane laminate technology basically combines the advantages of hollow fibre and flat sheet/plate membranes in a smart way. In contrast to flat sheet/plate membranes, the Bio-Cel membrane laminate is backwashable like a hollow fibre module but without the clogging problems which are frequently encountered with the latter. The self-supporting membrane sheet is just 2 mm thick, resulting in a high packing density and low specific energy consumption. Moreover, the Bio-Cel module incorporates a self-healing mechanism. If the membrane is damaged, the spacer material in the core of the laminate allows this damage to be repaired with the help of the biomass in the system. Even if the membrane laminate is severely impaired, solids and bacteria can still be rejected by it, so that a constant, high effluent quality is maintained. The module’s open top and bottom channels reliably prevent sludge deposits and fibre accumulations during the continuous crossflow process. The self-supporting structure of the membrane module enables frameless installation, thus eliminating blockages around the external boundaries of each component. 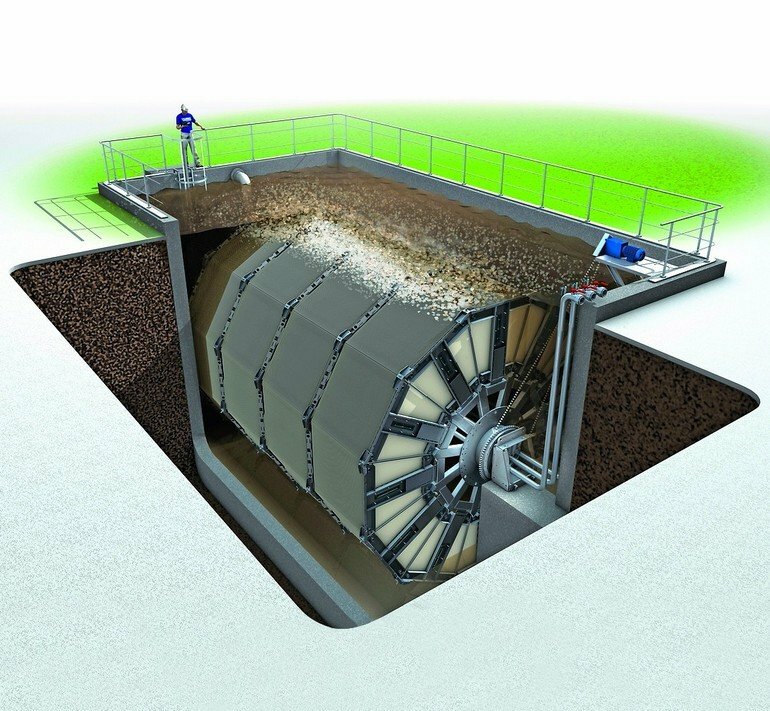 The Huber VRM membrane filtration unit is a rotating system. The membrane modules are submerged in the activated sludge. The module segments are arranged around centrally installed air tubes. A filter drive causes the trapezoidal membrane segments to rotate through a scouring air jet. The rising air bubbles continuously transport the concentrated sludge upwards through the gaps between the membranes. Covering layers and particles are effectively and reliably removed from the membrane surface, resulting in reduced fouling. 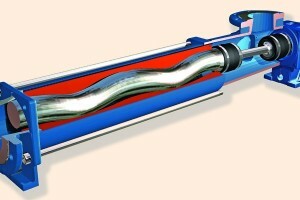 Power consumption is very low as half the air injection depth is sufficient due to the rotation of the membranes. Since the membranes are rotating, only a part of the installed membrane surface is cleaned by the scouring air at once. Also, if the flow rates are low, the unit switches to an energy saving mode in which the air is blown in intermittently. 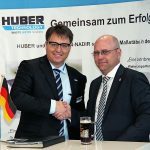 Huber VRM membrane filtration recently underwent a fundamental redesign in cooperation with Microdyn-Nadir. 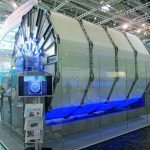 The common goal was to develop the biggest submerged filtration unit combining the numerous benefits of the rotating membrane system and the Bio-Cel module technology. 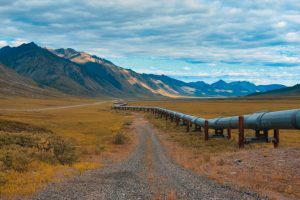 Smart laminate technology is now used to fit the trapezoidal segments of the Nadir flat membranes instead of welding them onto a plate as previously. The results are certainly impressive: throughputs of up to 300 m³/h and energy efficient, yet highly effective, rotational cleaning of the membranes with less than 150 l/m²h of scouring air required. The Bio-Cel modules additionally boast a long life and are inexpensive to clean. As ultrafiltration membranes, they guarantee excellent effluent quality. 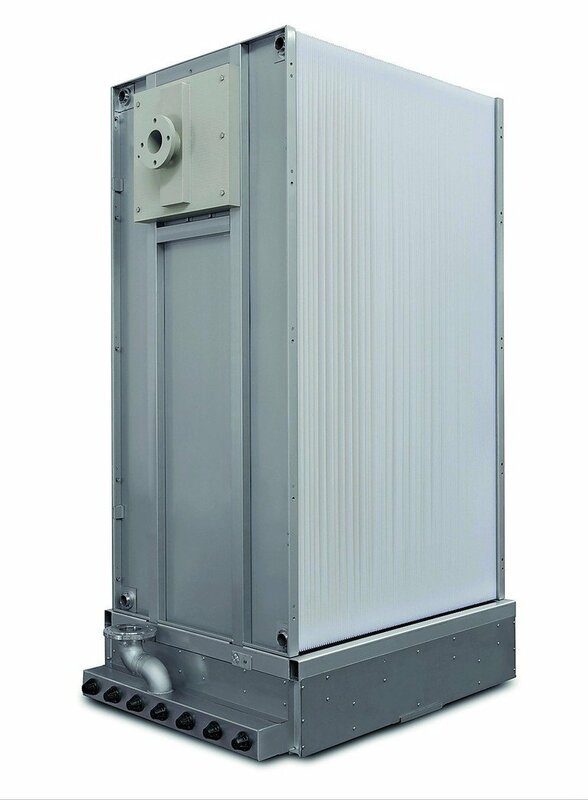 With a membrane surface of more than 9200 m², the VRM 50 exhibited at Ifat 2016 is currently the largest filtration unit available in the market. 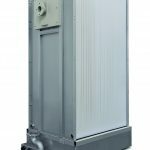 The VRM rotating membrane filtration unit has been used successfully in municipal and industrial MBR processes for many years. A membrane filtration system allows the structures required for the clarification process to be reduced in size and improves the performance of wastewater treatment plants. The VRM process is a combination of biological wastewater treatment and solids-liquid separation. 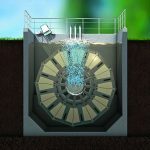 The mechanically pre-screened wastewater is aerated and clarified biologically. All solids within the flow (particles, bacteria, viruses) are then sucked through the ultrafiltration membrane according to the low-pressure principle. Problems with scum or sludge overflow, which are a frequent occurrence with classical sedimentation, are no longer an issue with filtration directly from the activated sludge. 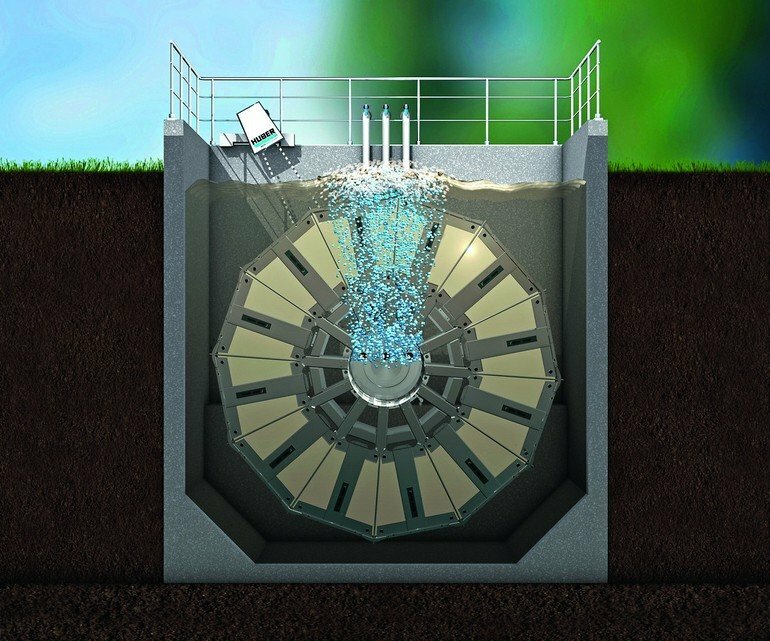 By increasing the concentration of the active biomass to between 12 and 15 g/l it is possible to improve the efficiency of a conventional wastewater treatment plant without having to install larger tank volumes. Existing structures, too, can be easily retrofitted with an MBR system. 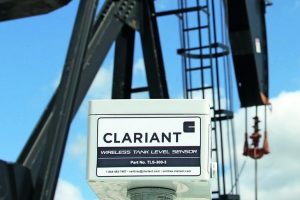 Preliminary and secondary clarification tanks can be modified and used further as storage and stand-by tanks. Furthermore, the effluent quality of such plants complies with all presently applicable standards and even permits the bacteria and germ-free effluent to be reused directly as service water (e. g. for irrigation). 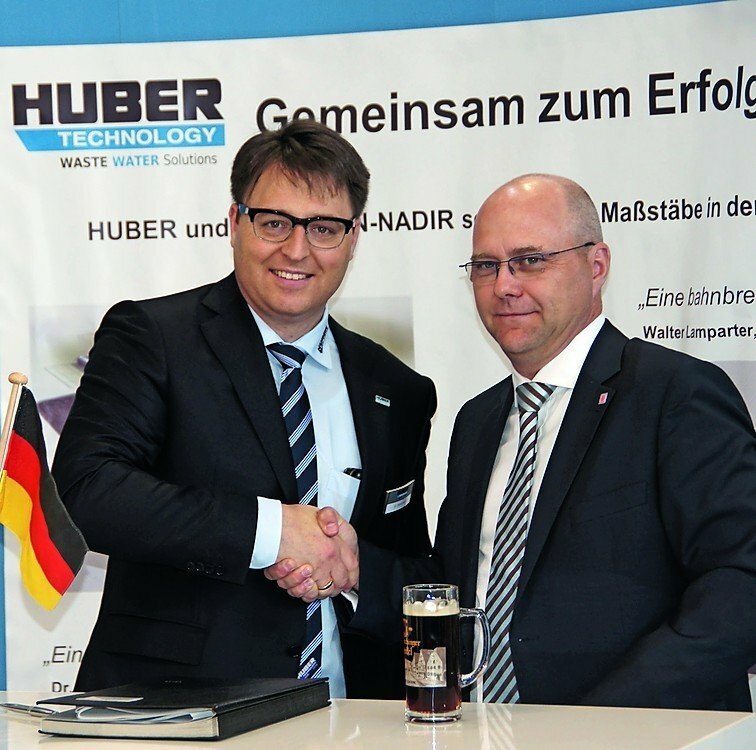 In all membrane systems Huber uses a hydrophilic membrane with very good filtration properties and a low affinity to wastewater constituents that are otherwise liable to cause fouling and deposits. In terms of their pore size (approx. 38 mm) the membranes belong to the ultrafiltration class. Apart from the liquid phase, only ions and low-molecular dissolved substances pass through the membrane. The flow rate is typically up to 35 l/m²h depending on the surface.